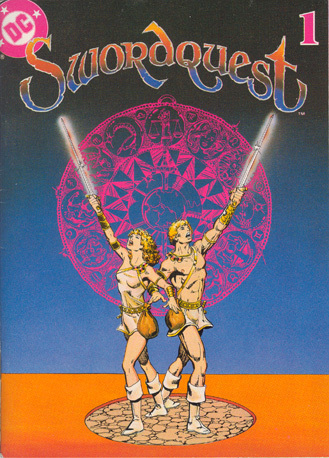 The SwordQuest Challenge was conceived by Howard Scott Warshaw and Steve Wright, and originally was called the Adventure Series. 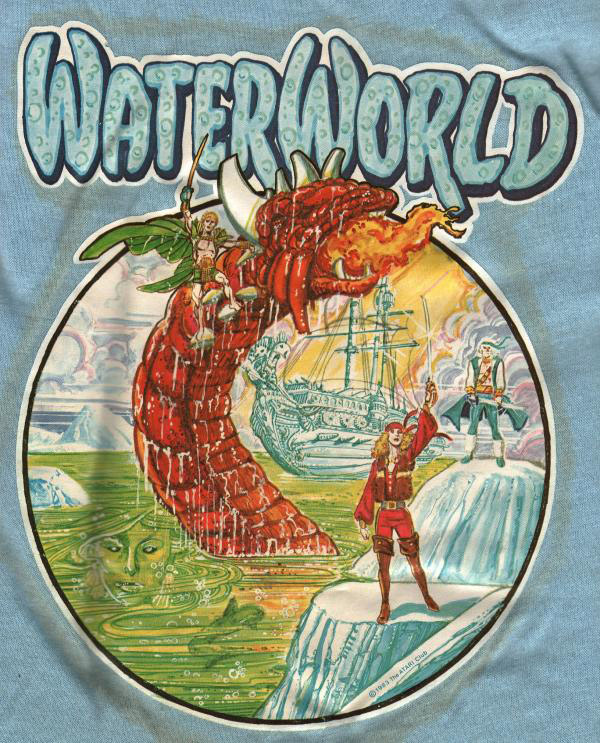 It encompasses 4 separate games: EarthWorld, FireWorld, WaterWorld, and AirWorld, which each game having its own contest. The prizes were valued at $25,000 (although the first 2 were worth a bit less at the time they were awarded). Air (Soul, Emotions; power of the unconscious mind; connecting to the source; reception). 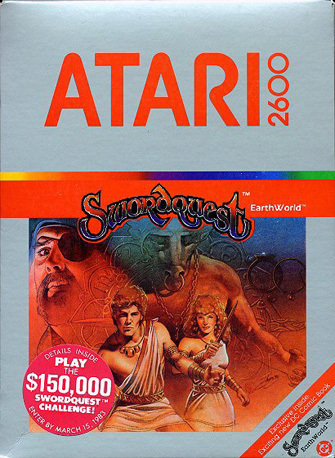 Atari hired marketing firm Amrein Marketing Associates, Ltd. to handle the SwordQuest contest. All contest entry forms were to be mailed to P.O. Box 8902, Westport, CT 06888. 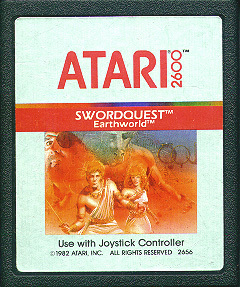 The series was heavily promoted by Atari, and the first game, EarthWorld, was released in October 1982. † The game was coded by Dan Hitchens, under the design direction of Tod Frye. † The band of the sky in which the planets move is called the Zodiac, which is divided into 12 Signs (each sign represents a specific energy pattern or mode of expression, and contains 30 degrees, or 1/12th of a circle). Together they comprise the 4 basic Elements, and each act in ways, or modes. Each group of 3 Signs of the same element is called a Triplicity, and each group of 4 Signs of the same mode is called a Quadruplicity. The game is based upon these Signs, and the rooms are laid out in a circular pattern for this reason. Gemini – Libra – Aquarius denote Air. The comic book further illustrates the significance of the Zodiac. Each Zodiac “room” has a corresponding House (there are 12 Houses in Astrology, and each House has a planet which is its natural ruler), and the main characters eventually cross paths with all the rulers of each House. † It’s possible to run through all the different waterfalls (in Leo) without stopping. † There are invisible “lines” running vertically down the screen that (when crossed) trigger the next waterfall, or the entrance to the zodiac room. Notice that the waterfalls slowly move to the left. If you let one (the first one is the most difficult since there’s little room to maneuver) of them pass w/o triggering the next line, it will eventually wrap-around the screen! † There was no comic book, poster, contest entry form, or contest sticker on the box. Atari Benelux promised there would be a contest when they released the games, but that never happened. † Did you know the PAL version has a different solution? 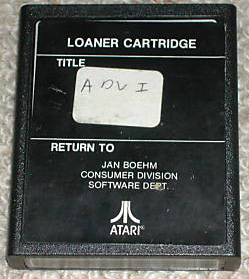 Luc Pycke obtained a fax from Atari Benelux (who obtained it from Atari International) containing the solution, which was supposedly hand-written by Dan Hitchens. The solution does have a few errors - #5 and #10 were incorrect. The correct solution appears below, along with a copy of the fax. † The inventory bar/strip actually extends to the very bottom of the screen, unlike the NTSC version. Also, each clue gives a bit more of the EarthWorld “fan fare” (as mentioned in the manual), rather than different tunes for each, as in the NTSC version. 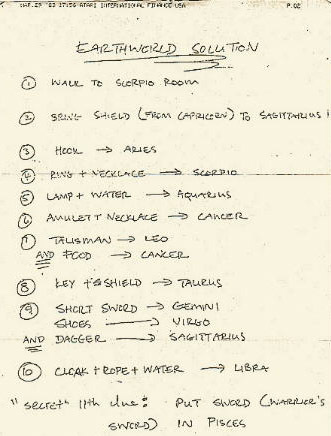 † It’s interesting to note that there are only 11 levels, since the game is based around the 12 Zodiac symbols. 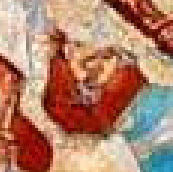 Perhaps there is a yet-unfound 12th clue? Stephen Perry Doussa, 18, Arabi, LA - absent from contest? John D. Hoffman, 30, Waterloo, NY - absent from contest? 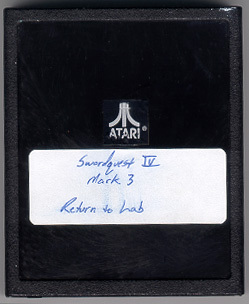 † At least 7, possibly 8, special edition “championship” carts were made. The championship was held on May 2, 1983 at Atari’s headquarters in Sunnyvale, CA. The contest had a 90-minute time limit. Steven Bell finished the game in 46 minutes, 49.4 seconds. 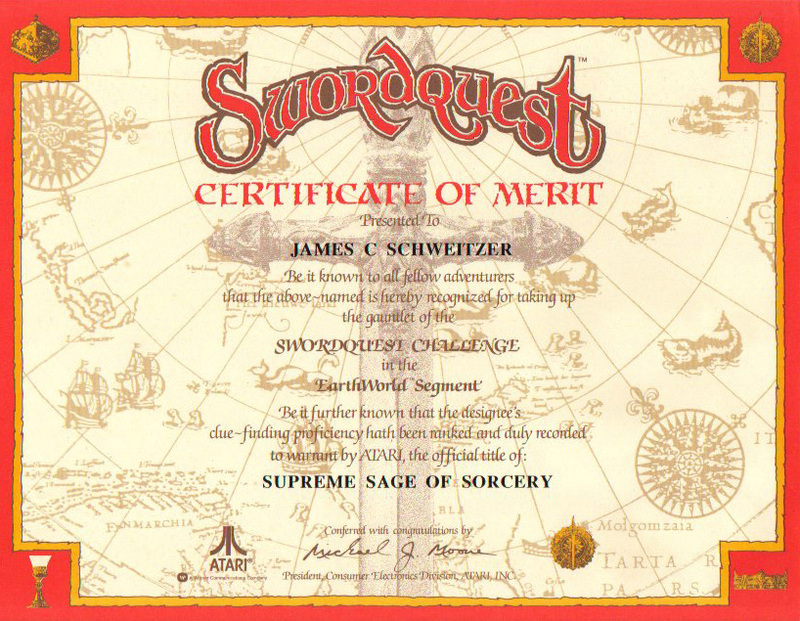 † An interview with finalist James Schweitzer can be found HERE. 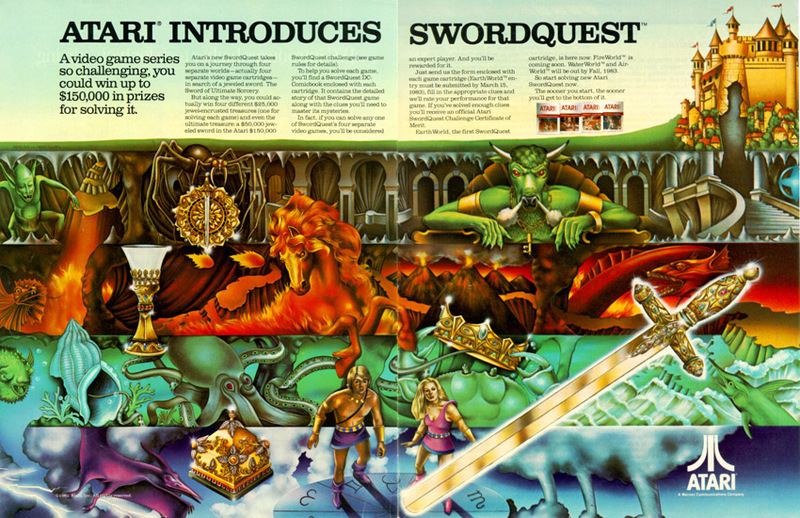 † It was long believed the PAL version was the same “Special Edition” version used for the contest, since it was mentioned that the contest version comprised 11 “levels” of play. This is not the case. 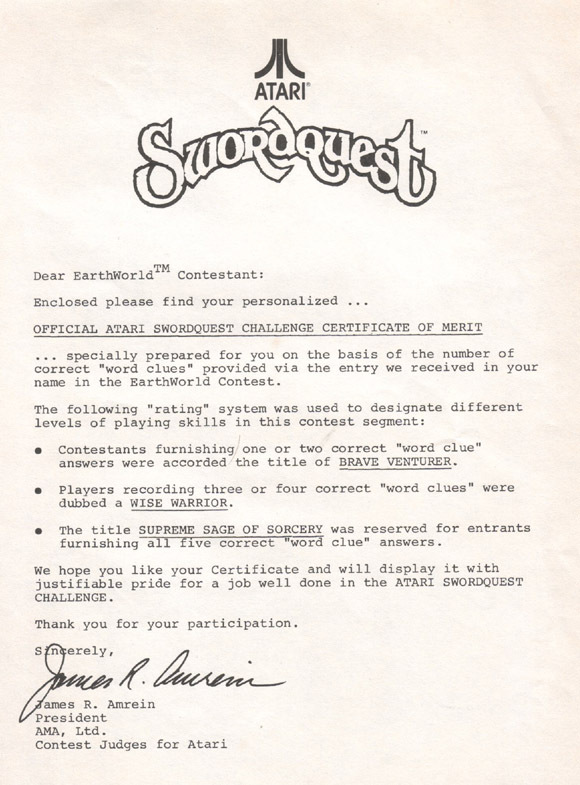 John-Michael Battaglia, who was a writer at Atari, kept a copy of the EarthWorld Playoff Contest Rules, along with programmer Dan Hitchen's handwritten notes for the solution to the contest version, and made them available on his WEBSITE. I was a Senior Copywriter at Atari in the early days of the video game industry. I wrote instruction manuals and packaging copy for several Atari 2600 and Atari 5200 video games. 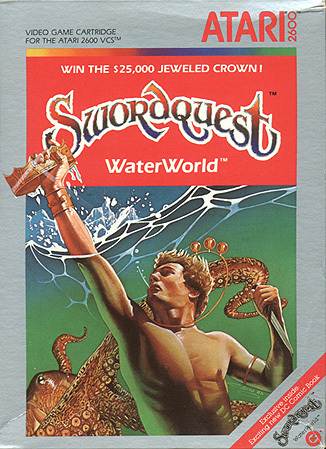 I also worked on special projects, like the Atari Swordquest Challenge, around the same time that I was writing the manual for WaterWorld, one of the games in the four-part SwordQuest series. 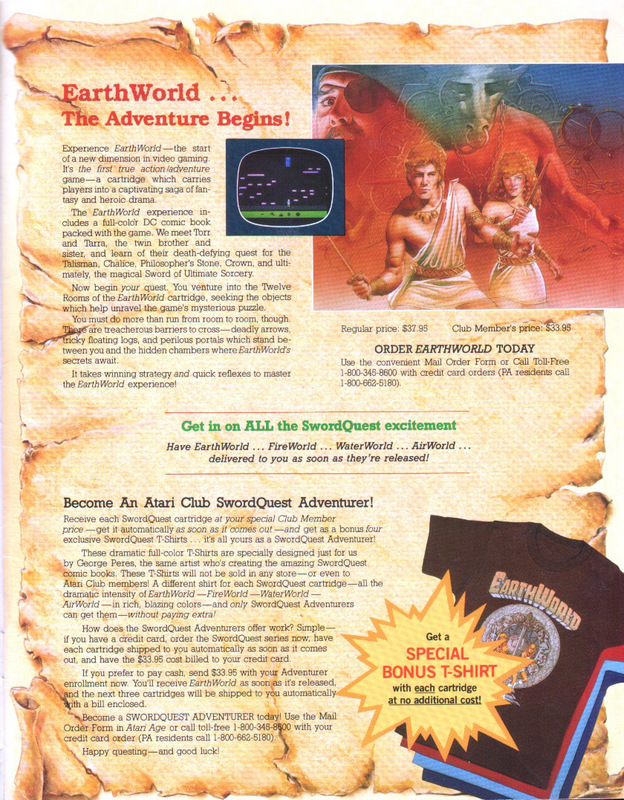 For one of the four playoff competitions in the Atari SwordQuest Challenge, I had all of two days to come up with a way to allow a half-dozen contestants to compete in a race to get through all the levels of EarthWorld, a brute-force adventure game that had required gamers to spend weeks of their lives trying to figure out the astronomical permutations regarding which 16 magical objects needed to go into which 12 rooms of the Zodiac at various points in their quest for a magical sword. 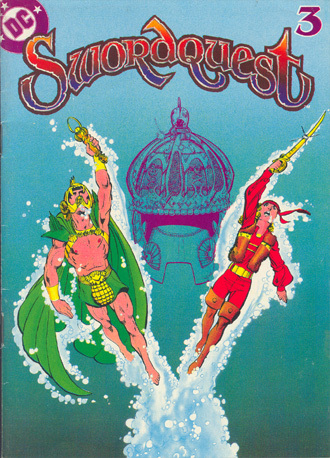 Atari had sold over 500,000 of these games in a gigantic cross promotion involving DC Comics and the Franklin Mint, and, without clues to guide them through the adventure, only 7 people managed to get themselves invited to participate in the quarter-final playoff tournament. 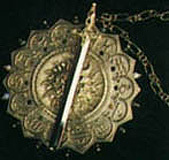 The playoff winner would walk off with a $25,000 prize, as well as earn a chance to compete in the final SwordQuest Challenge for a jewel-encrusted sword worth $50,000. Since all the rooms in Earthworld were named after the houses of the Zodiac, I wrote a series of arcane clues that directed the keenest reader among the contestants where to place the correct magical objects and race to victory within less than two hours. Essentially, I provided word-clues with an astrological theme to blend aspects of the game's key elements in the context of a puzzle based on the game's theme. As the participants later acknowledged, the arcane word-clues added a twist that elevated the original design of the game to a more entertaining level, while also making it possible for someone to actually solve the game/puzzle in time for the luncheon award ceremonies. I got a nice memo of appreciation from the product manager for making the playoff competition a success, and the whole episode was written up in Atari Life, the Atari employee newsletter. 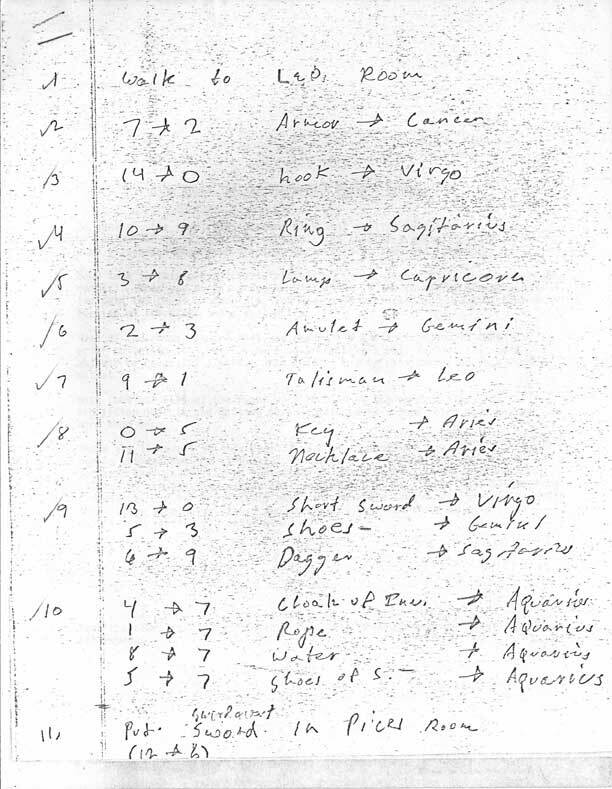 Of course, while it is not possible to play the limited edition playoff game that was programmed exclusively for the playoff, anyone wishing to try their luck deciphering the arcane clues can do so now by first getting very familiar with both the list of magical objects and the signs of the Zodiac. Your eye-hand coordination won't be tested like it was in the original game play, but at least you might have some fun trying to figure out what magical objects go into what astrological houses —based on the Earthworld play-off word-clues that I wrote for the playoff. Just don't expect a jewel-encrusted sword to be waiting for you if you succeed! The playoff winner navigated through the puzzle in less than an hour, leaving us all plenty of time to enjoy the luncheon ceremony that followed. How well can you do? † A copy of the memo from Joel Oberman to Battaglia, dated May 3, 1983, can be found HERE or on Battaglia's site. 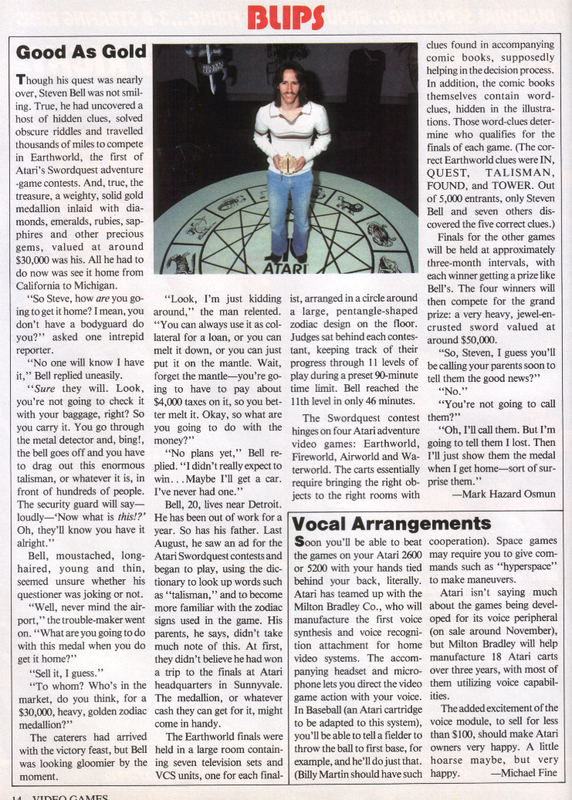 † A copy of the Atari Life magazine article can be found HERE or on Battaglia's site. Note that Stephen Perry Doussa isn't listed as one of the finalists, but that John Hoffman is! Thomas Neill's last name is also spelled as "Heil" and Steven Bell's hometown as St. Clair Shore. 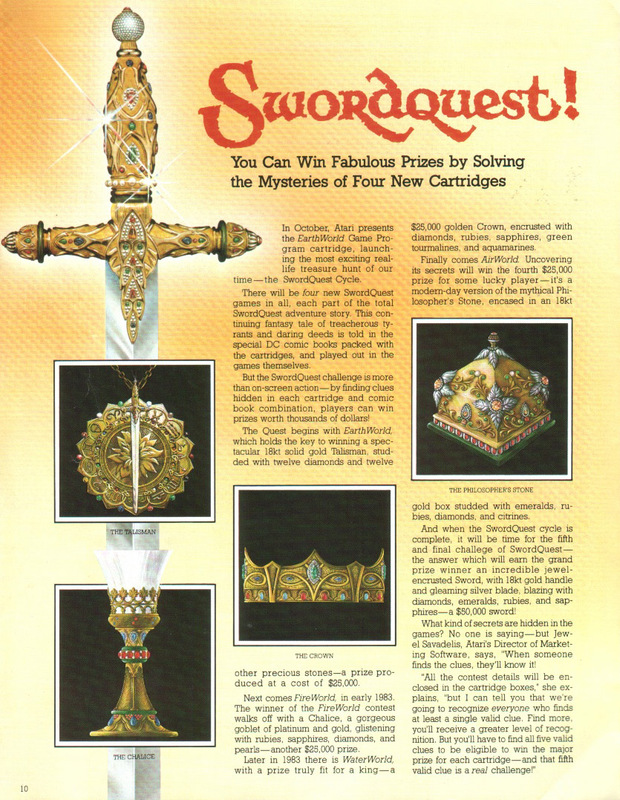 † Battaglia is also in possession of a one-of-a-kind SwordQuest EarthWorld Sears-style manual! † It’s possible to “warp” up into adjacent rooms. In some rooms corner warping can be used to also go left, right, and down. Was this by design or a glitch? In room E, sometimes when trying to warp to room G you will reappear on the other side of the room instead. You can also get stuck on the walls in this room when trying to do corner warps. 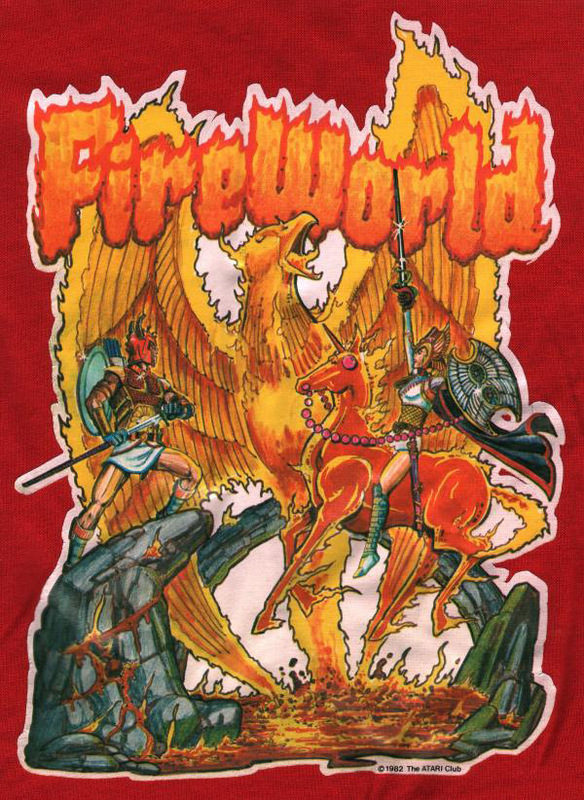 † Pictures of the FireWorld contest were found by Clive Young in 1999 and appeared in issue #58 of the “2600 Connection”. They can be found on their site HERE or on DP HERE. † The clues don’t have to be found in order. The meaning of the clue numbers is unknown, but it’s possible that being they were simply numbered from 00 to 09 meant that there were 10 word clues to find in the comic book. † In the Salamanders skill test (room J), your “line” character gets longer each time you are hit. † When you find a clue, occasionally a block (cursor) will appear in the inventory. To get rid of it, go in a treasure room and place your cursor over it and “drop” it, otherwise you won’t be able to carry 6 objects. † Normally you have 8 chances to finish some skill tests (all but the Snakes and Dragons). Each time you fail, you’ll hear a “miss” sound. With the Goblins test though, you only get 7. Notice that when you first start the test you’ll hear a “miss”. There’s also a way to hear 9 “miss” sounds with the Goblins test– at power up, wait until you see the screen showing your character and then start the game. 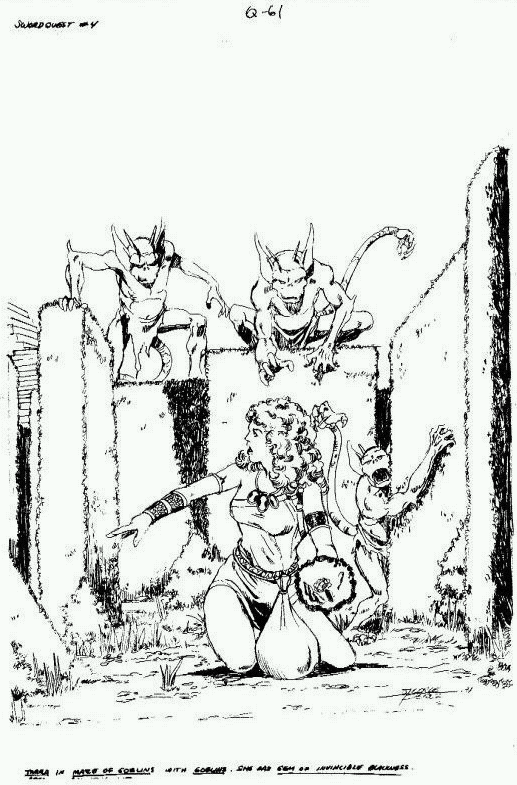 If the very first test you do is the Goblins, you’ll actually hear 2 “miss” sounds at the start, instead of 1. † There are numerous glitches that appear with the skill tests. With the Snakes test, you may be stuck on the screen when you start (your character won’t appear) or when you kill all of them (and the screen doesn’t change); with the Flamedragons, you may see a “bolt” of fire shooting up from the bottom when you start; with the Salamanders and Firebirds, the bottom border may disappear as you are hit. All tests seem to suffer from poor sprite-collision detection (ex. 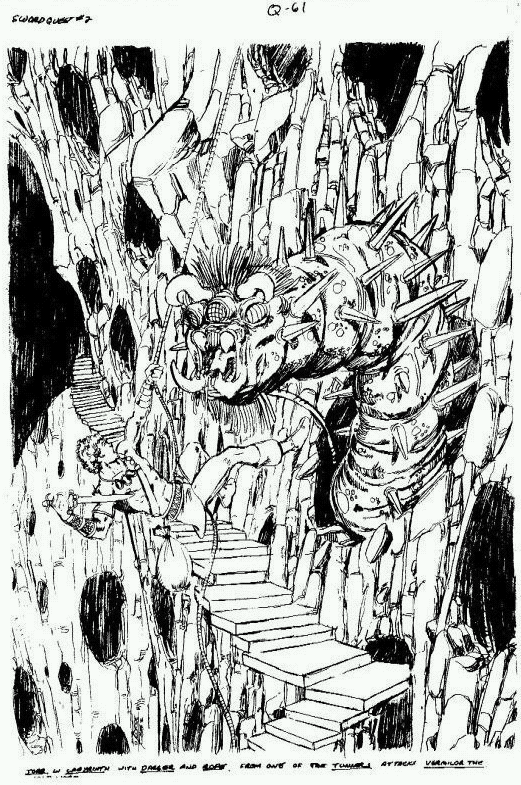 a goblin or knife may slip past you and not be counted as a miss). † Luc Pycke programmed a Commodore 64 version of FireWorld, back in 1983! Unfortunately, programming was never completed. 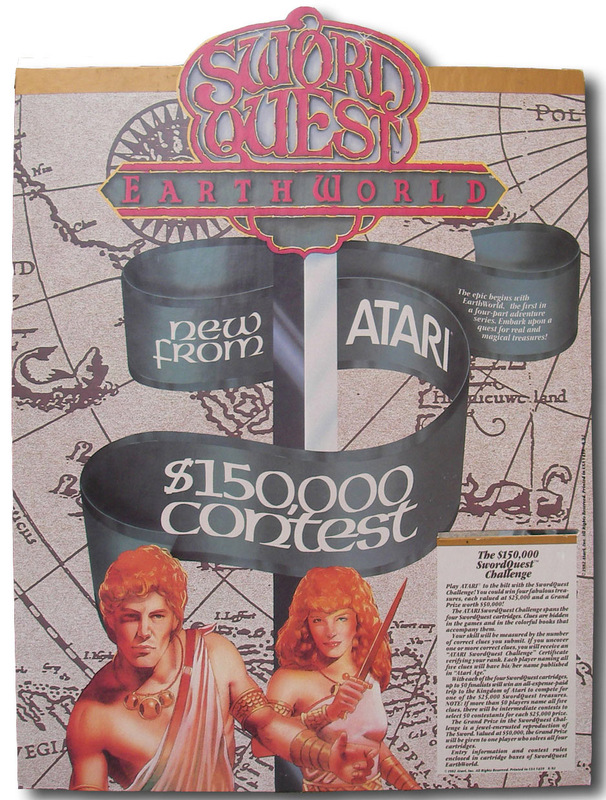 † As with the PAL EarthWorld, there was no comic book, poster, contest entry form, or contest sticker on the box. 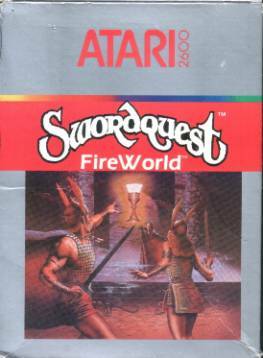 † The PAL FireWorld box is also slightly different from the NTSC version – “SwordQuest ” appears in solid white lettering, with “FireWorld” in large letters underneath it. † It is believed the PAL version is actually the “Special Edition” version used for the contest, although it was later discovered this did not hold true for EarthWorld. † The inventory “block” glitch is more prevalent in this version. Clearing the block creates another rope item, which will appear in the room. You can actually create enough ropes to have 6 in your inventory and one in each room! 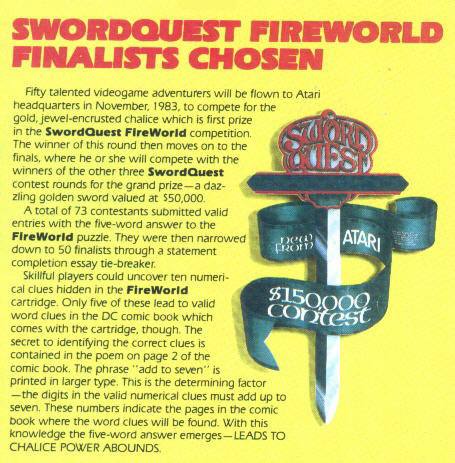 † There were 73 total finalists - according to the winner, Atari had a “run-off” whereby they sent everyone a piece of paper with some questions, and the finalists had to write in so many words or less what they liked about the game. Out of those entries, the judges picked 50 contestants. † At least 50 “championship” carts were made. † The deadline for entering the contest was July 15, 1983. 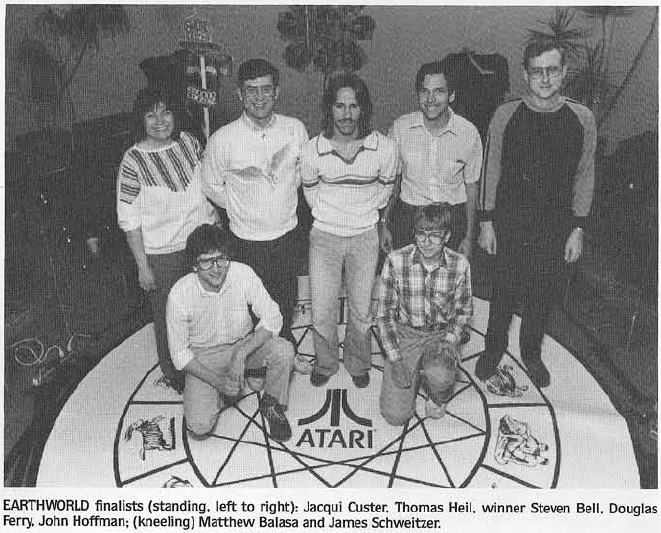 All the finalists were to be flown to Atari to compete in November of 1983, but the contest didn’t take place until January of 1984. The reason for the delay is unknown. † The winner was Michael S. Rideout of Aiken, SC, who finished the game in 50 minutes. † The game is based on the Kundalini Chakra. 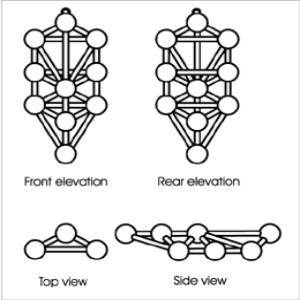 Go to http://www.tantra-kundalini.com/chakras.htm to learn more about this, and to see a chart showing the 7 Chakras, and how it relates to the room layout. † The original contest entry deadline was December 15, 1983, but was extended to April 15, 1984. 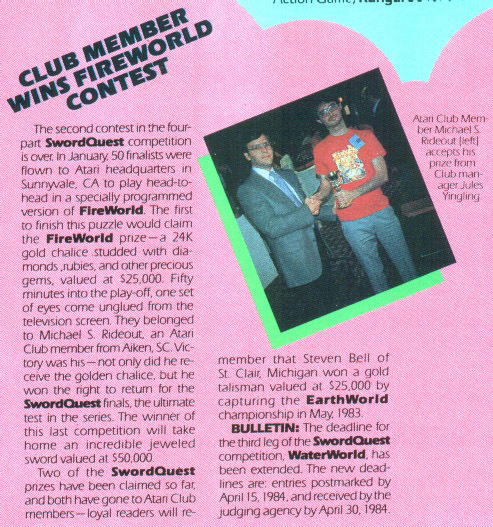 † According to an interview with FireWorld winner Michael Rideout, “They (Atari) chose the finalists although if I remember correctly, they reduced the number to 15 instead of 50. This caused a lot of people to get upset. This was right at the time Atari was sold and everything went into limbo. I don't think the Crown was ever awarded…”. The interview can be found HERE. 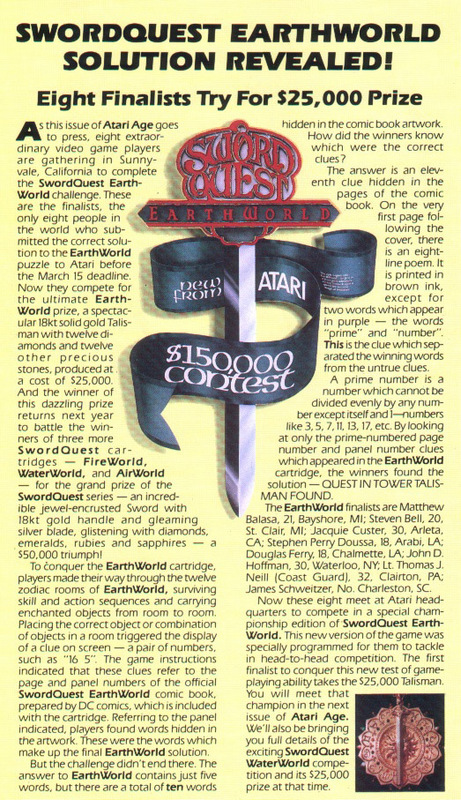 Atari cancelled the contest before a winner was declared. † A PAL version was never released. 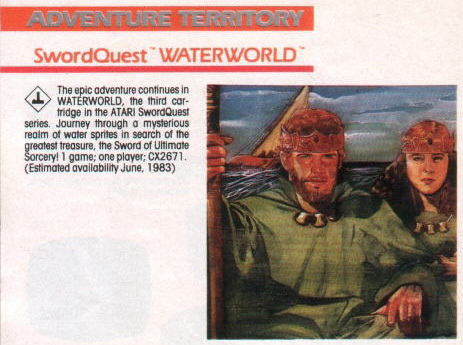 As the independent judging agency for the ATARI SWORDQUEST CHALLENGE Program, we are delighted to inform you that your entry in the "WaterWorld" Contest has been officially graded and found to contain all four correct "word-clue" answers. In fact, your entry was one of the total 45 submissions received in this contest segment which supplied the four right words. Because the number of contestants who provided the four correct "word clues" exceeds 10 (as stipulated in the Official Rules ... please see photocopy attached), we are proceeding to the contest tie-breaker procedure described in Rule #5. This letter represents your personal invitation and only notification of participation eligibility in the WaterWorld tie-breaker contest. No other correspondence or telephone exchange may be entered into, and no responsibility can be assumed for lost, misdirected or late mail. 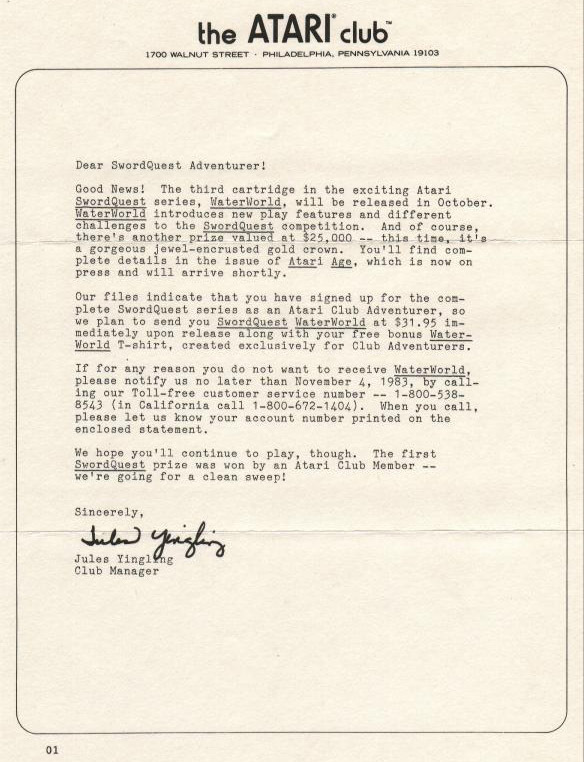 Therefore, we direct your attention to the "statement-completion form" which accompanies this letter, calling for your own response to the starter-line "What I like about the Atari WaterWorld video adventure game is...". Your reply may be written long-hand or printed (clearly in ink) or typed on the form provided, and should not exceed in length the lined-spaces indicated on this one-sided sheet. Your statement-completion form should be sent via first class mail to the address indicated thereon and must be postmarked no later than June 15, 1984. All on-time tie-breaker entries will be held, unopened, until the first week of July when each shall be individually judged "on the basis of originality, sincerity and aptness of thought". The decisions of the judges shall be final. All entries become the property of Atari, Inc. and cannot be returned. Winner notification shall be effected no later than August 1, 1984; subsequent to such notification, personnel from Atari shall be in contact with the tie-breaker winners concerning timing and travel arrangements for the play-off trip to California.. leading to the WaterWorld Crown which is to be awarded as this contest segment's Grand Prize. 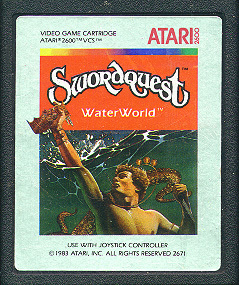 Congratulations on having reached this advanced stage of the WaterWorld segment of the ATARI SWORDQUEST CHALLENGE! 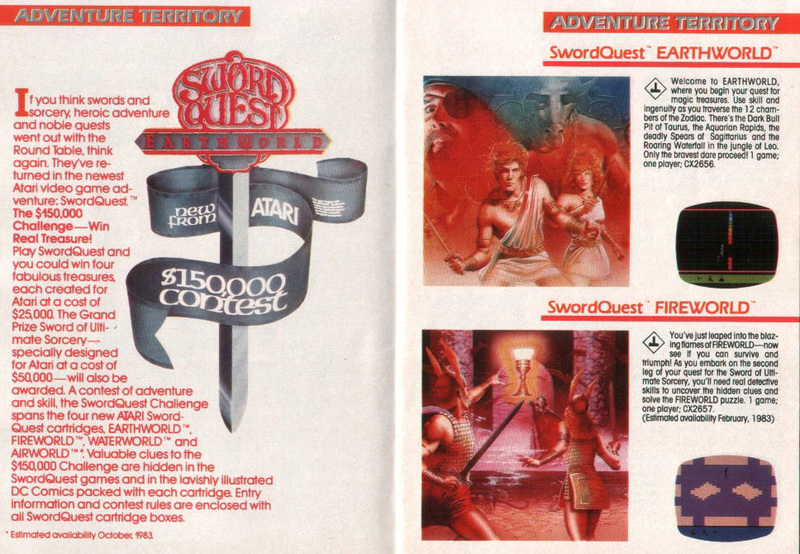 Atari was sold to new owners last summer and, with the attendant changes in personnel and future plans, we literally found ourselves at a point where there was such a program as the SWORDQUEST CONTEST. Not only did this situation take a while to correct, but then the lawyers had to resolve who was now responsible for the contest prizes (the new owners or the old owners). A very conscientious and industrious attorney for Atari has the matter in hand now and wants to resolve this matter in the very near future. I wish there was more we could tell you now, but our firm's role was simply to judge the entries. Prize payments are the sponsor's responsibility, and we found ourselves mid-stream in judging without a sponsor if you will. Thank you for your patience ... it's not been forgotten and is nearing resolution, and you'll hear from Atari on this sometime shortly. 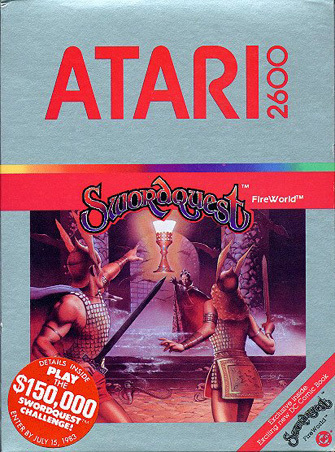 As you may know, Atari, Inc. sometime ago disposed of its computer and video game business, with the result that the SWORDQUEST promotion, originally conceived almost four years ago, no longer has value. 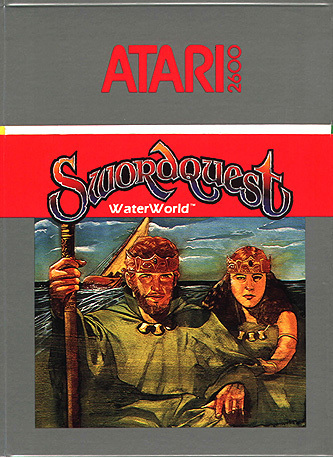 A plan for resolution of the SWORDQUEST Contest has been reached with the firm which bought out Atari, Inc.
Our agency served the original program as its independent judging agency, and we regret to inform you that your statement-completion entry in the "WaterWorld" tie-breaker was not one of the winning submissions. Thank you for your patience and your participation. † The game is based on the Chinese I Ching (the “Book of Changes” - see www.power-press.com or www.ichingwisdom.com for more information). It consists of “tribars” – sets of 3 bars that can be either whole or split – and there are 64 different tribar combinations, called hexagrams. 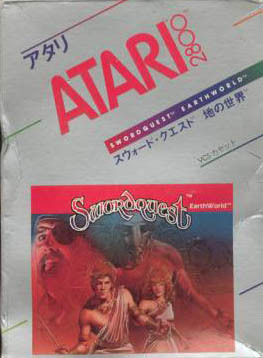 The gameplay in AirWorld was based on a 64-bit game language that determined the player’s speed, enemy A.I., and other factors. 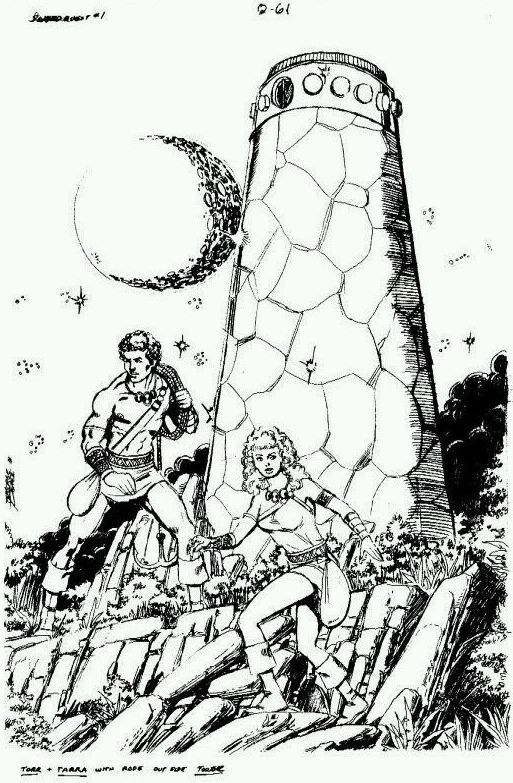 † The above artwork supposedly came from Brian Ballestri, who was an editor for the internal Atari company newsletter, Atari Life. 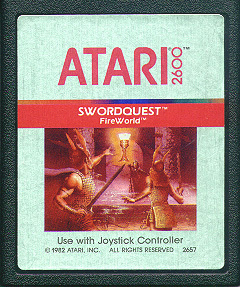 † A copy of Atari's internal product assembly list for AirWorld can be found HERE. “AirWorld did get started, and I was digging it, but I got asked to port Xevious to the 2600 after 2 other programmers gave up on it. 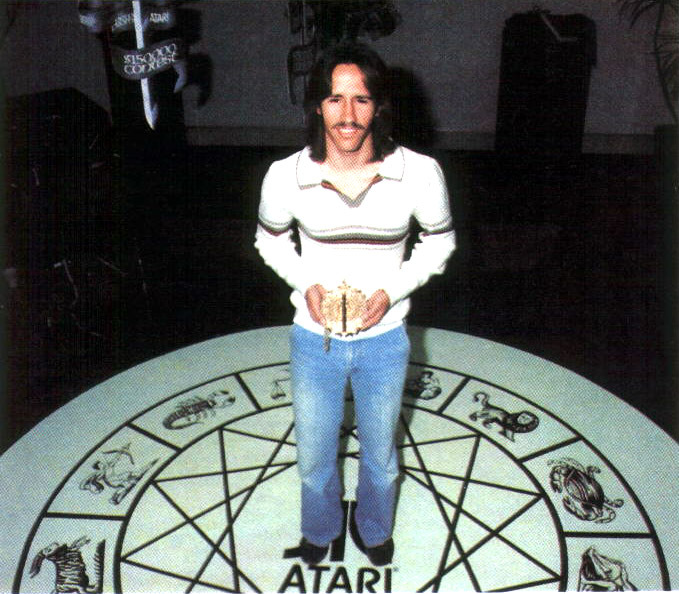 † According to former Atari programmer John Seghers, he remembers seeing Tod Frye testing out AirWorld, and confirms the room structure (layout) was based off of the I Ching (possibly 8 rooms, each representing a different tribar?). 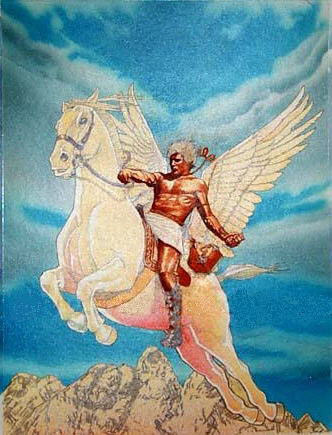 The game screen he saw was a first-person flying perspective of your character flying over a landscape – he believes it was suppose to be Torr on the flying horse (as depicted in the above artwork). Howard Scott Warshaw also confirmed the I Ching was the basis for the game during his presentation at the 1997 Electronicon show. 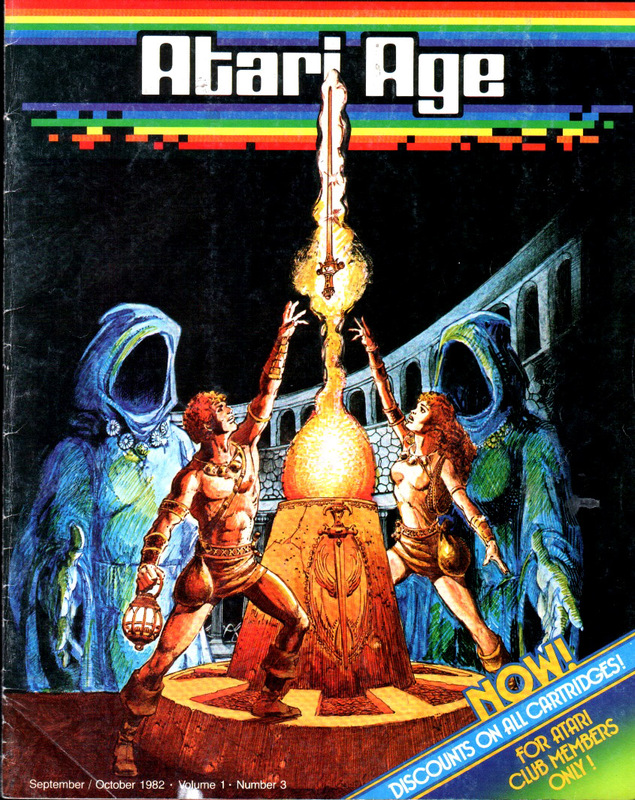 In actuality, the fake screenshots were not from a hacked ROM but rather a Photoshop creation using a combination of EarthWorld screenshots, original artwork, and even a character from a different game (the horse on the title screen is actually the Nazgul from Parker Brothers' Lord of the Rings game). Also, the inventory objects are too detailed for the system’s hardware, and (on close inspection) the player’s character reveals a green background pixel from the original screen the character was taken from. 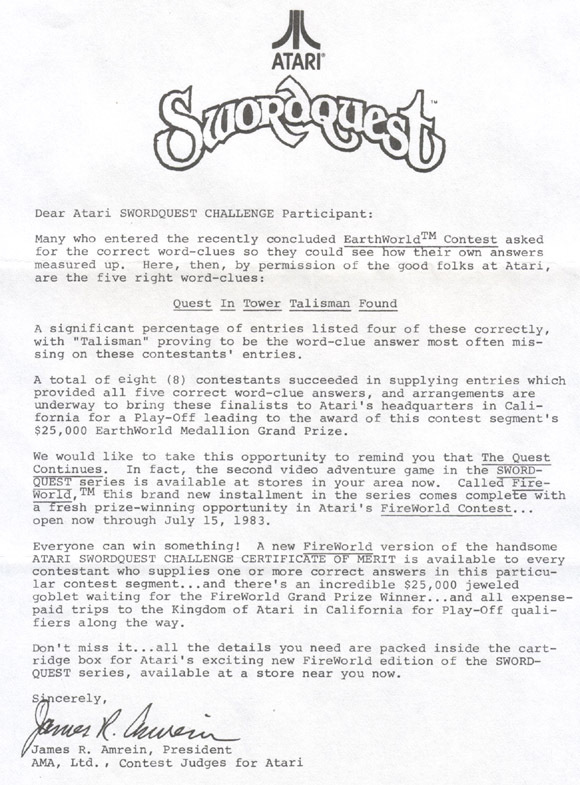 "An Atari attorney named Angelo Pisani stepped up to take responsibility for attending to prize awards due contestants, and that was the last we knew of the Swordquest matter, our firm's judging responsibilities having been fulfilled. If you can find Angelo, you may very well be on to the final chapter in this. 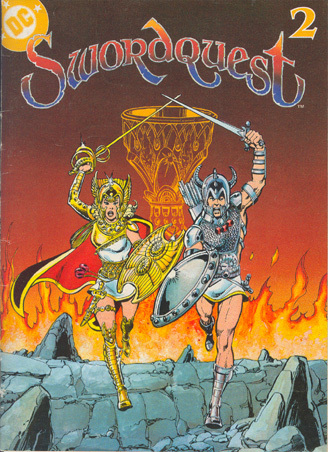 Other client-side names that date back to that time in Sunnyvale included Marketing Director Jewel Savadelis, a fellow in Marketing with some involvement in Swordquest named Steve Bengston, and a Marketing Dept. promotion type name Ralph Giuffre ... Ralph moved on to Activision and later an area of Disney in Burbank and then I lost him. I believe he's an alum of Santa Clara so it's conceivable its Alumni Relations area would have current contact info for him." 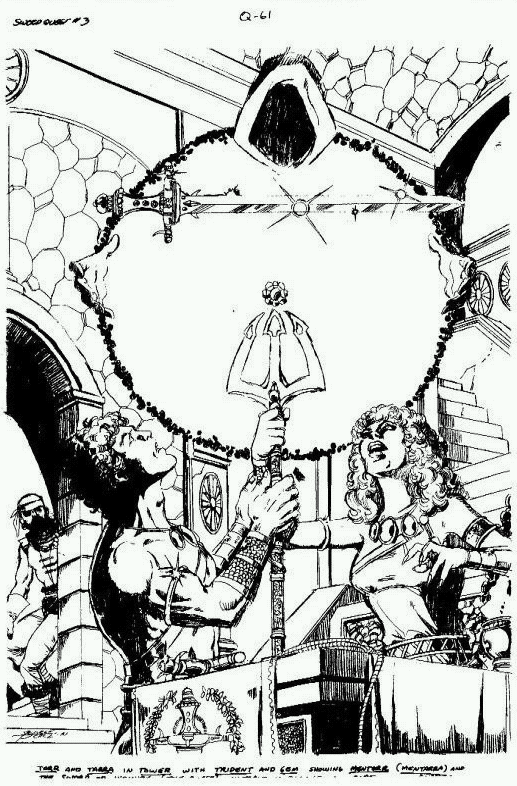 † It is rumored that the Sword (and possibly the other prizes) ended up in the hands of Jack Tramiel, and that it’s hanging over the mantle of his fireplace. 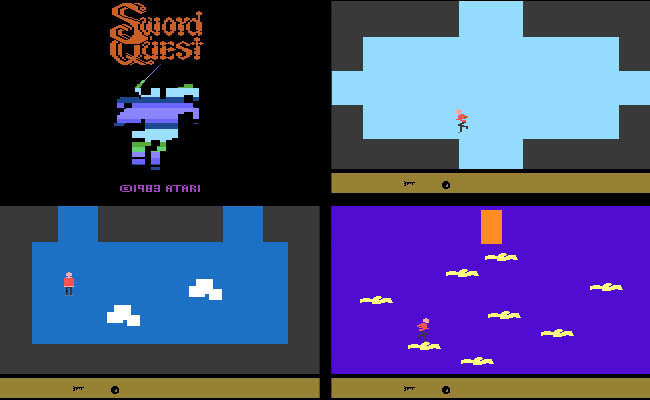 The person who posted this story noted that the sword in question also reportedly has an Atari “fuji” symbol on it, although it’s not depicted in any of the artwork photos that were released. The address listed As far as we know, none of his future plans ever materialized. 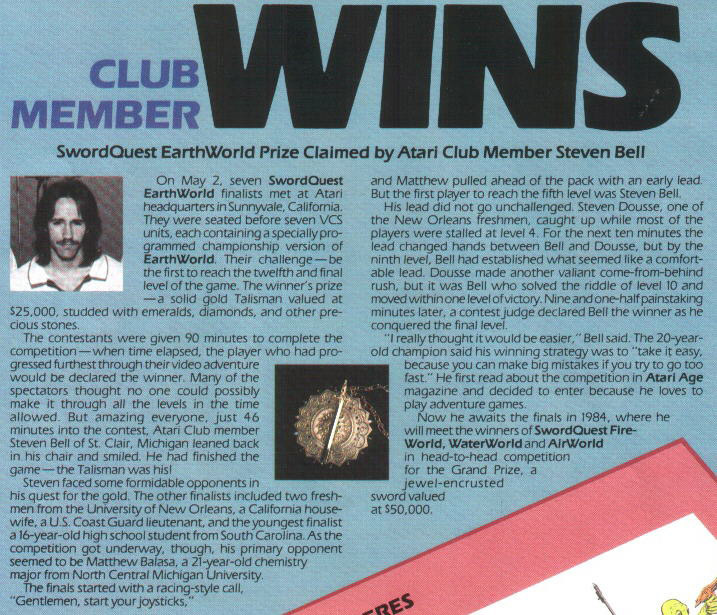 † In the April 1985 issue of Electronic Games, he wrote a letter urging people to contact Atari and pressure them to complete the contest. As it turns out, he was the person who sued Atari when they cancelled the contest. 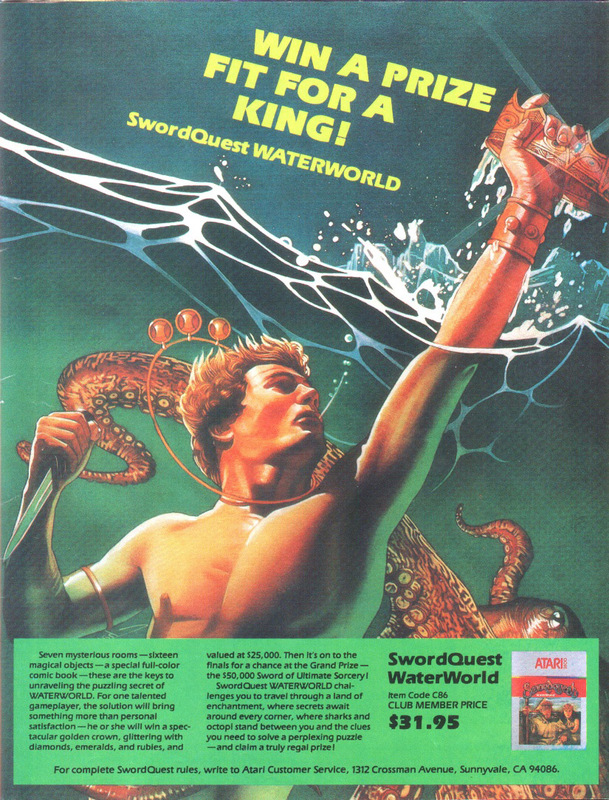 † This article is intended as a companion to Walton C. Gibson and Keita Iida's incredible SwordQuest “Archive of Adventure” website. Lafe Travis did an excellent job of converting Russ Perry Jr.’s (NTSC) ‘SwordQuest solution’ articles, which originally appeared in the "2600 Connection" newsletter. 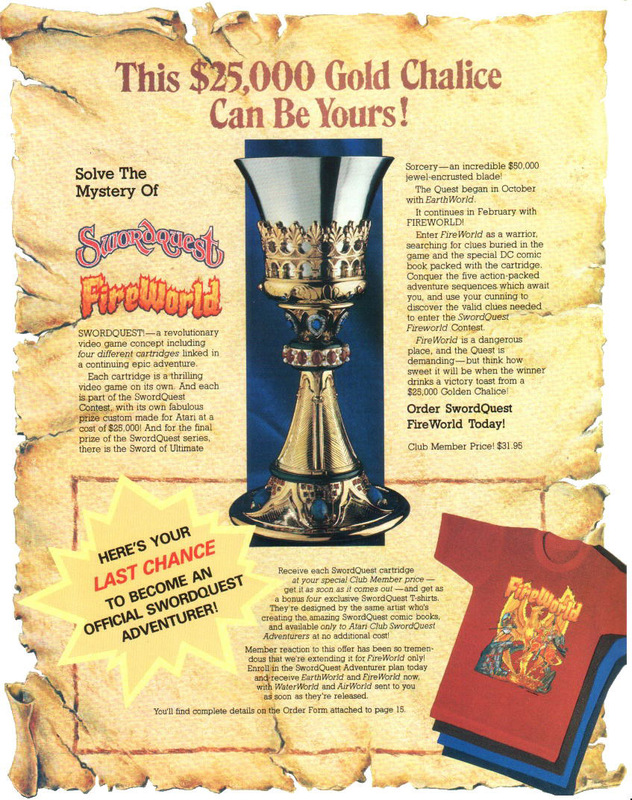 † To date, no one is sure who actually solved the NTSC versions of EarthWorld and FireWorld. It’s possible either the programmers or an associate “leaked” this information out (as they did for the PAL versions) but there was never a formal announcement from Atari. If anyone has any information concerning this, please email us. 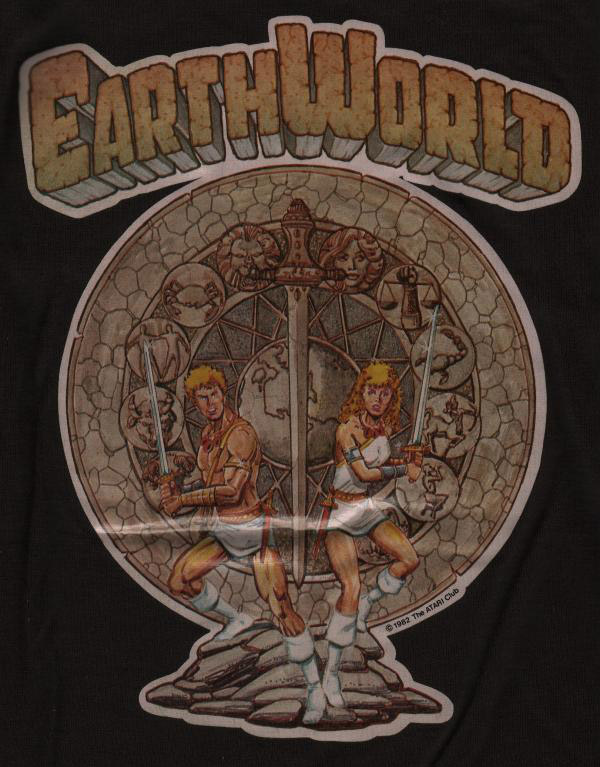 † Was a T-shirt designed for AirWorld? 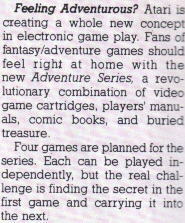 The Atari Age article from issue #3 suggests all the shirts were done at that point, although only the artwork for EarthWorld is shown. † Check out http://www.djay.com/astrol/intro.html for more information on Astrology. † Special thanks to Russ Perry Jr., Luc Pycke, James Schweitzer, George Pérez, John Hardie, Tod Frye, Howard Scott Warshaw, John-Michael Battaglia, James Amrein, Anthony Sandridge, and Dan Amrich.